dear reader, you might know that from 25th May 2018 the European GDPR -General Data Protection Regulation UE 2016/679 is coming to a complete application in all Eu countries. For this reason I need to inform you that I can only email you if you let me know you want to stay in touch. 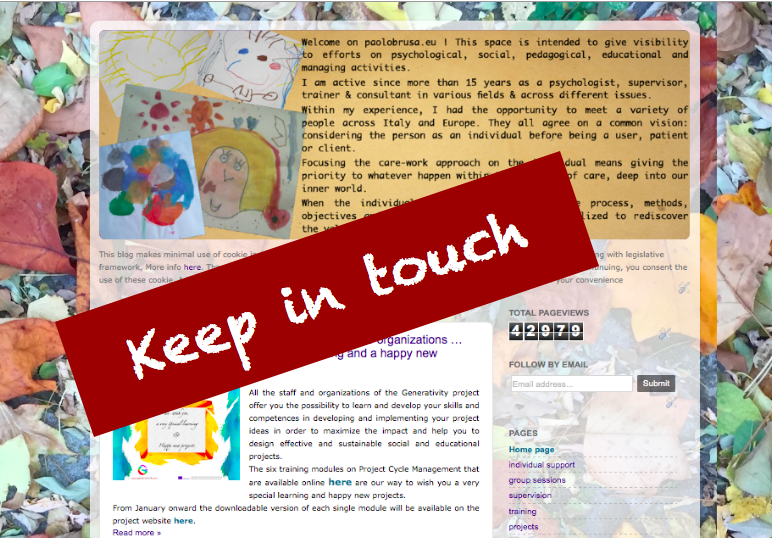 I would like to be able to stay in touch with you & let you know about what I am up to from training & group-work sessions, to research & advocacy work, to the publications & opportunities to collaborate & share. I will use the information you provide on this form to send you regular updates on my work. Please confirm that you would like to hear from me by sending this mail back to me. By sending this mail back to me, you agree that I may process your information in accordance with these terms. For more information about my privacy practices please read the information on cookies at the dedicated page at privacy policies.